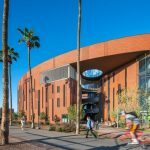 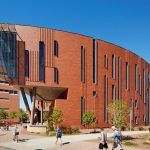 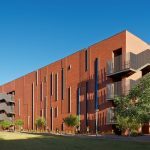 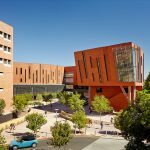 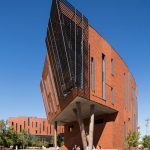 McCord Hall – Rhino Masonry Inc. 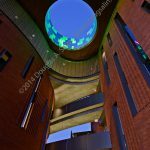 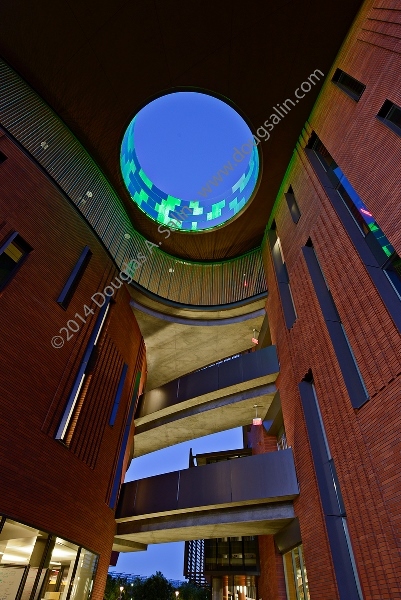 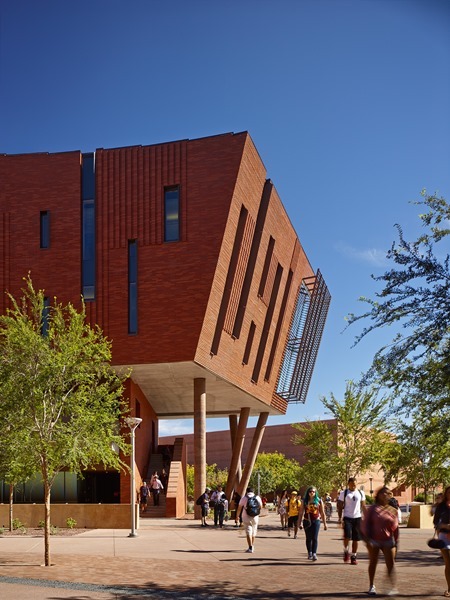 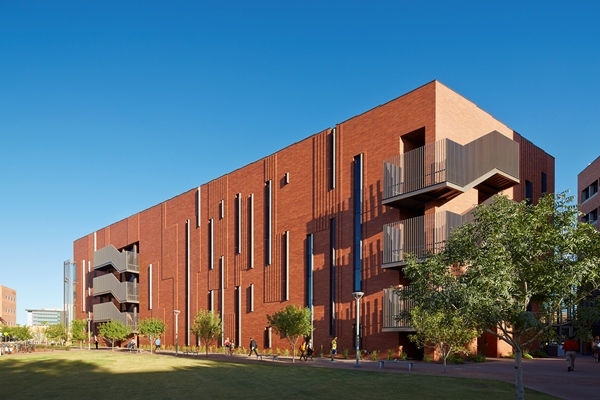 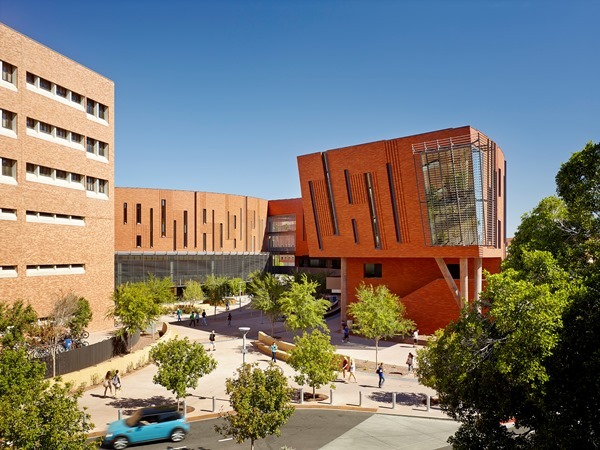 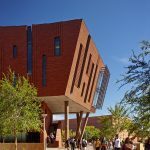 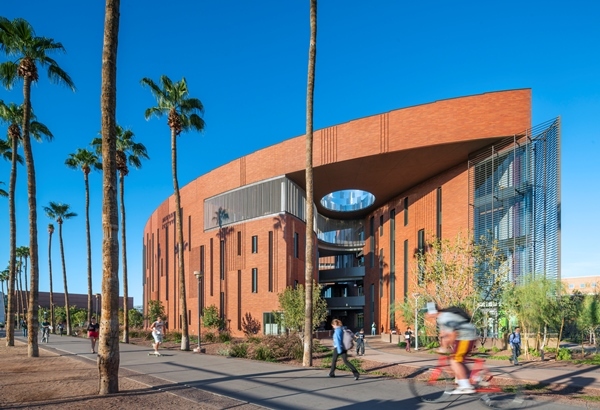 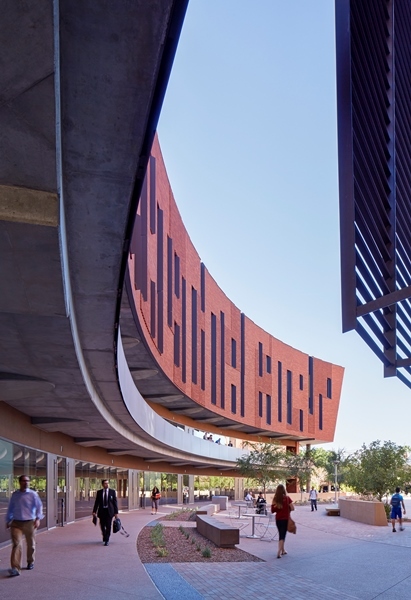 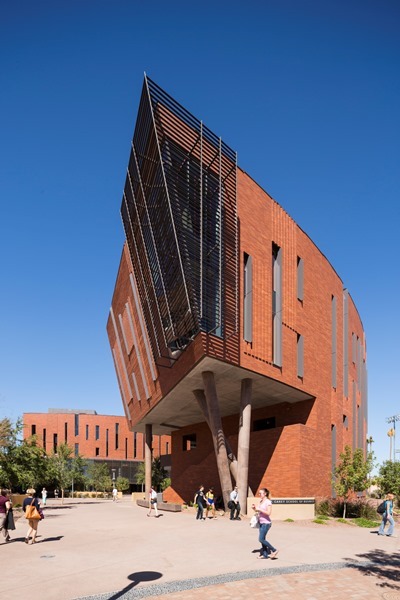 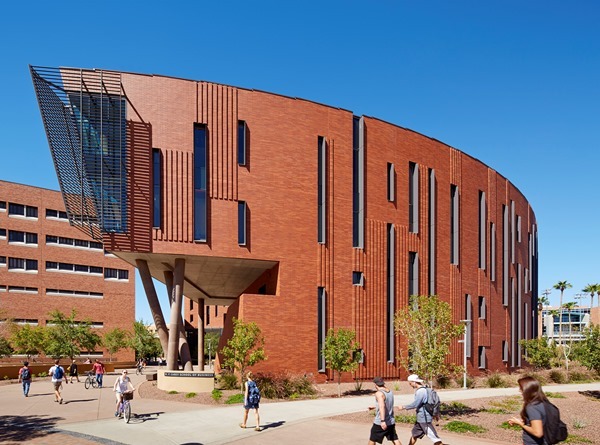 The most prominent feature of the building is the brick, whose colors were selected from a local mix of natural earth tones - red, orange, and gold - to provide a variegated color sympathetic to the neighboring ASU context and to reinforce the color variation provided by moving sun and changing sun angles. 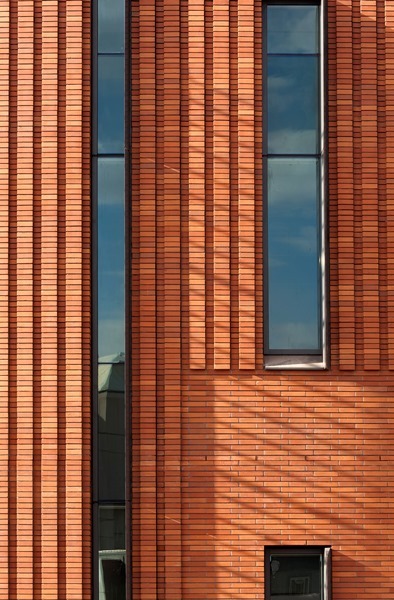 The Norman brick's horizontal proportion and larger scale is appropriate for an institutional building, the twelve inch brick length works well with the "horizontality" of the building as well as the depth of the returns of the ten inch deep vertical slot windows. 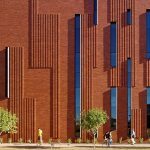 The "corduroy" texture is made of L-shaped bricks projecting two inches that create eight inch wide vertical ridges with four inch reveals between. 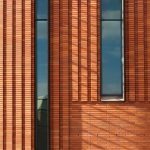 This sculptural pattern creates shadow and texture and hides control joints in its shadow. 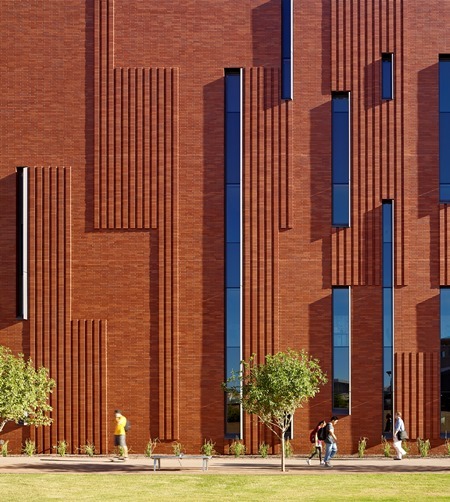 Flush vertical and raked horizontal joints with dark coffee-colored mortar further reinforce the horizontality and monolithic nature of the wall. 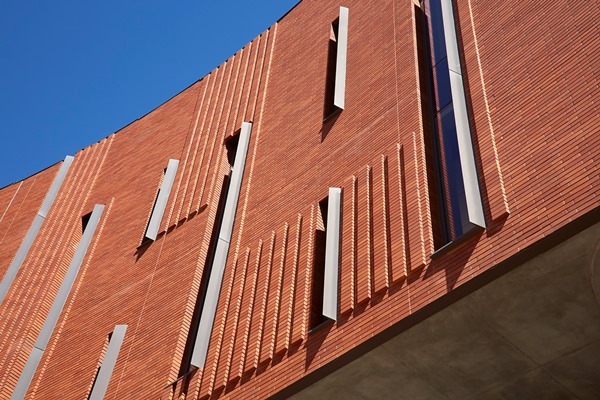 Additional depth and texture are provided by projecting asymmetrical aluminum fins at the vertical strip windows. 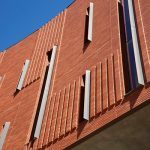 The flat field of the wall is an offset running bond pattern. 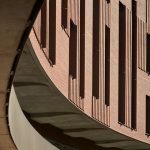 At the corduroy, the in situ workmanship mock-up showed that consistency along the curved face could best be maintained with a stack joint pattern. 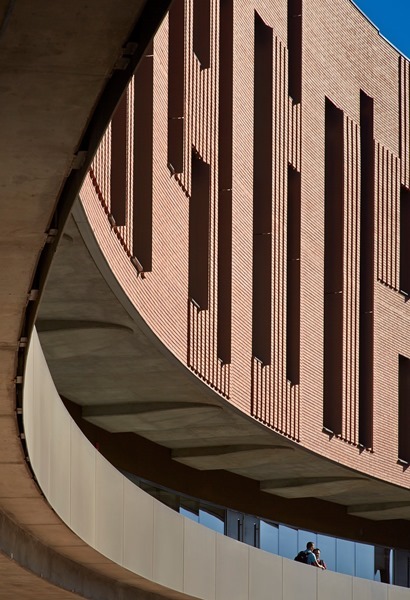 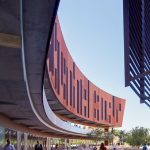 The two inch relief of the corduroy ridges accentuates the reading of the sun's movement on the building's curved surface like a sun dial: as the sun moves the viewer can actually watch the shadows lengthen and shrink in real time.